Celebrate wetlands in your home using the Ancient Graffiti Metal Dragonfly Wall Art. Some cultures regard dragonflies as symbols of summer and happiness, and this sculpture will certainly add a lively look to your wall. An elongated, central body shape supports the four, extended wings, while an orb at the top mimics the dragonfly's head. Indentations along the body evoke a dragonfly's segmented abdomen, and two lengthy antennae complete the unit. The metal construction ensures a durable adornment, which can beautify an indoor or outdoor wall equally well. Its flamed copper colored finish offers dimension, and the slight iridescence reacts with light for extra drama. Secure this item to your wall using its attached bracket and a screw, enjoying the texture and theme it adds to the area. 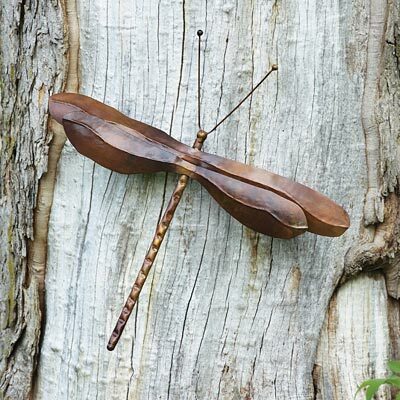 Bring a familiar and fun insect to your home or garden wall with this Metal Dragonfly Wall Art.